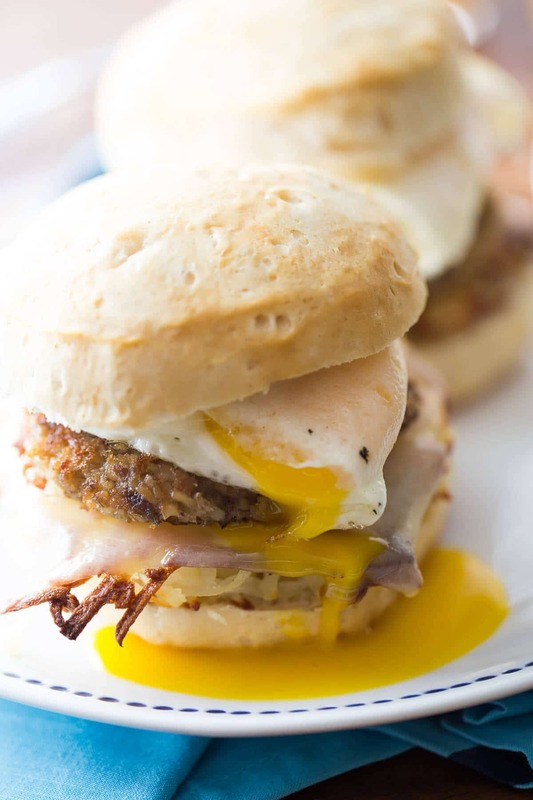 A hearty breakfast sandwich is a great way to start the day! 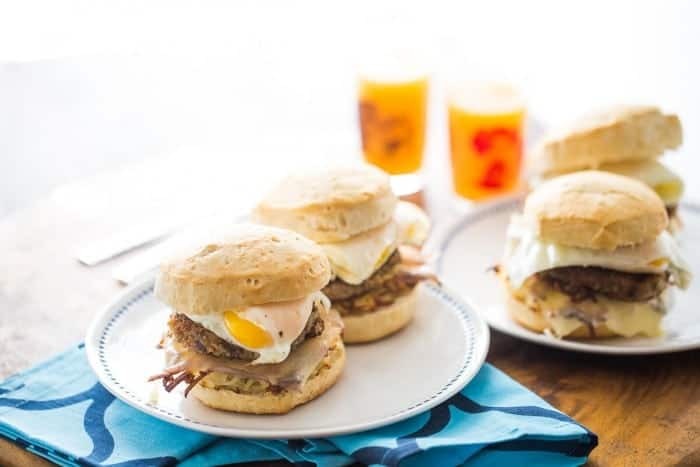 Biscuits are loaded with hash browns, cheese, goetta, and eggs; everything you love in a big breakfast, but in one hand held sandwich! There was a time in my life when I was thoroughly grossed out by different food groups touching each other on my plate. I’d practically gag at the site of gravy from my mashed potatoes touching my corn or ranch dressing from my salad touching my fruit. I wasn’t a picky eater; I just couldn’t handle too many flavors blending. I was a purist I guess. I wanted my corn to taste only of corn, no gravy, no dressing, nothing. Just corn. Not sure when this all changed for me, but it did. I find I often prefer my food groups combined. Now I do crazy things like throw bacon into my pancakes and top my baked potato with barbecue chicken. The way I see it, it’s all going to end up in the same place. Besides, some things do taste good together. 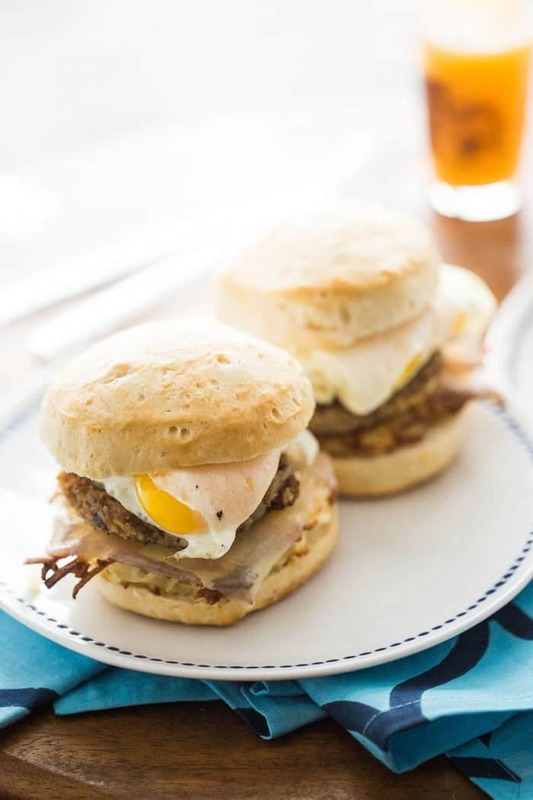 Take this breakfast sandwich for example. It has everything you love about a savory breakfast in one sizeable sandwich. Let’s break it down. To begin with, I baked up eight large buttermilk biscuits. Next I added hash browns. I used refrigerated; store-bought hash browns to which I added an egg, butter and a bit of cornstarch. I created eight mounds of hash browns and baked them! I find this is the easiest way to make potato pancakes that are good and crisp. I topped the potato cakes with nutty Asiago cheese slices. I love the flavor the Asiago lends this sandwich, but you could use any cheese slice you like. Next, I added some goetta! Goetta is a sausage and grain mixture that is big where I live. It’s typically a combination of pork and oats; it’s awfully similar to scrapple. You can find this near your breakfast sausages in your supermarket. If goetta is not available, then traditional pork breakfast sausage is a great substitute. Fried eggs are the crowning glory. I liked to keep my fried eggs on the runny side. I love how the runny yolk creates a sauce for my biscuit sandwich, but of course, fry your egg the way YOU like it! I found between the egg and the cheese, my biscuit sandwiches didn’t even need butter. All they needed is one, big mouth that was willing to sink it’s teeth right into each layer. My mouth worked just fine. I’m the sandwich contributor at Food Fanatic! I have a cousin who is just like that. She CANNOT handle anything touching. As a joke we got her one of those little trays like you would get your lunch on at school with the little compartments haha! Nothing touches! These sandwiches look AMAZING! Everything I love about breakfast in one! You must live near Cincinnati! I grew up there in a northwest suburb. I’ve never seen goetta outside of Cincy. Now I have to ask, Gold Star or Skyline? I prefer Gold Star, but Skyline is clearly the more popular of the two. I know I’m taking a chance with this recipe; as many people won’t have any idea what Goetta is! Do you like it yourself? I am a Skyline fan; in fact, I think I’ve only eaten at Gold Star once in my life! So happy to connect with a former local! I do like goetta. I’m a Gold Star fan, but I never turn down Skyline either. Every time I’m back in town visiting family, I have to stop there. Love the blog, and excited to learn that you live in Cincinnati! Have you ever been to Goetta Fest that’s held down in Newport? I live in Colorado now, and they just don’t do festivals like Ohio does. Ohio does love their food festivals! I have never been to Goettafest; I seem to always have something going on. Perhaps this will be the year; Glier’s is the best! I’m so happy you found my blog Sarah!